I still can’t believe what I did last night. Shark diving. Just Brian and I. No chain mail suits. No defenses. 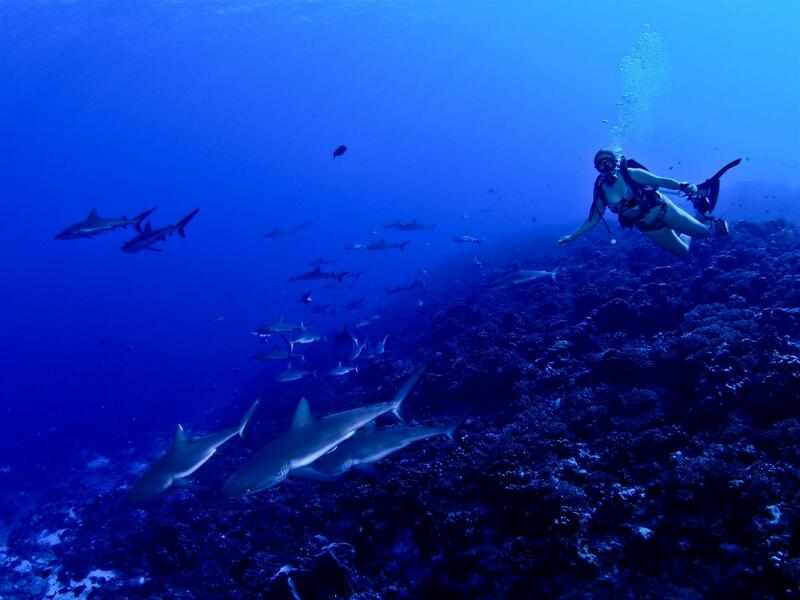 Just us and the sharks of Fakarava. It was incredible! And we still have all our limbs! Remnants of a pastel-colored sunset faintly lit the sky as we slipped into the calm water of Fakarava’s South Pass. Usually this is a current fueled drift dive but tonight we would stay in an eddy at the beginning of the dive and wait for the hunting sharks to come to us instead of drifting on the current. 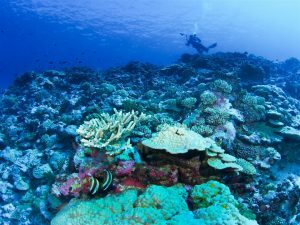 We descended to 40 feet and the various dark blues of the reef faded into black. I relied on my big video light to see what was going on around me. Luckily it can light up the whole reef! I was able to see at least 30 feet, which was comforting. This was only my second night dive, and it was a very adventurous one. Brian and I agreed beforehand we would stay at shallow depths and simply get out anytime we felt uncomfortable. Brian had our dinghy clipped to him as we swam, so we were always attached to our rescue vessel if things got out of hand. As soon as it grew dark the sharks began hunting. 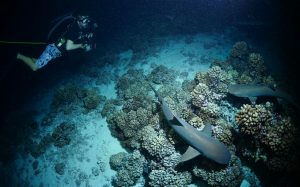 Gray Reef and White Tip sharks emerged from the darkness with a whole new personality. During the daytime these sharks drift lazily in mid-water or rest on the sea floor. Now they were aggressively darting across the sea floor in all directions, looking for things to eat. Oh, how they loved me and my big, bright light. I loved them back. A dozen sharks followed me like I was a bubble-emitting pied piper. You have to love sharks or this would be a terrifying experience. I’ve been diving with Fakarava’s sharks at least 20 times during the day, so I felt somewhat confident they would not be a problem. Also, Brian has already done two solo night dives with them. I swam around with my sharky entourage. The sharks would swim away to chase fish, but soon returned to my bright pool of light. 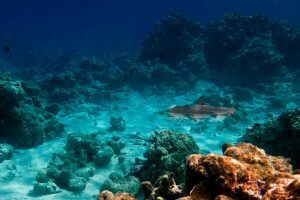 Sharks can see in the dark, but they seemed to enjoy the starling effect the light had on the skittish fishes trying to take shelter in the coral reef. And they needed all the help they could get. They were not very successful hunters. We observed many failed attempts at catching fish and never saw a shark eat anything during our dive. The hunting sharks were fast, furious and curious. But they showed us complete respect and did not treat us like prey. They never even touched us. We stayed with them for over 30 minutes, then ascended to our waiting dinghy. We had three sources of light to get back to Magic, and the weather was calm. We made our way back, splashing through small waves. What an exciting and unforgettable dive! Tahanea Atoll is a protected area with no permanent residents. Inquisitive Snappers look right in your eyes underwater and so do sharks. For the last ten days we have been the only ones diving here, and we met many innocent and curious fish. Have they ever seen a scuba diver before? How alien we must appear, with our tanks, bubbles and big cameras. We enjoyed half a dozen dives under Magic, usually with a couple small sharks. 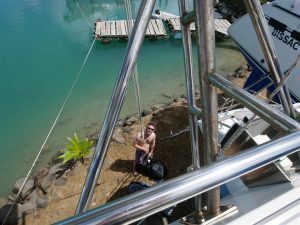 I fed leftover rice to the fish around the boat most days, which attracted plenty of small gray reef sharks and blacktip sharks. But larger sharks are out there. 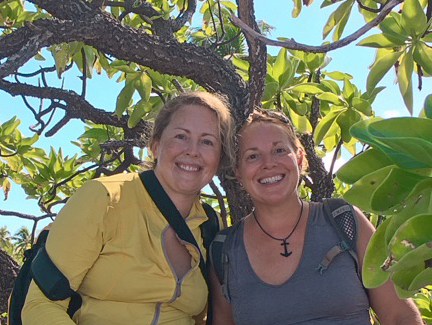 We saw a big Lemon Shark in the Tahanea lagoon, and it did something so creepy and memorable we nicknamed him Lemmy and joked about him for days afterward. Lemmy, short for Lemmywinks, was no ordinary shark. He had stalker tendencies, and followed us nearly a kilometer back to Magic. We first saw Lemmy underwater. 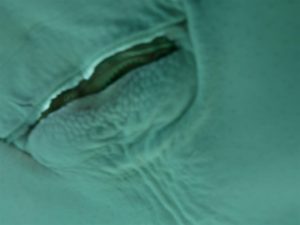 A two meter long, bulky Lemon Shark swam by several times during a shallow, hour long dive. 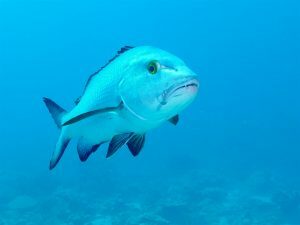 Each time he came closer, and the closest pass had him only fifteen feet away, swimming parallel to us along a shallow reef at a depth of ten meters. Lemmy’s brown body undulated in the dappled sunlight, pushed along by a swishing, paddle-like tail. His face was blunt and serious. His eyes rolled around in his head, regarding us warily. He seemed curious, not aggressive, so we hung there motionless in the water and I recorded a video as he quickly passed. We kept diving, looking over our shoulders, and did not see Lemmy for awhile. When we surfaced at the end of the dive and climbed into our dinghy, Lemmy was cruising around on the sand bottom fifteen meters below. Our heads broke the surface of the water. We immediately gushed about how long Lemmy was, how plump, how curious. He was one of the biggest sharks we’ve seen in the South Pacific. Was Lemmy dangerous? We didn’t know anything about him. With big smiles we raced back to Magic to watch our videos of Lemmy and identify him using our fish book. Our book showed Lemmy clearly. He is a Sicklefin Lemon Shark, can reach a maximum length of 2.2 meters and is considered dangerous. Yikes. 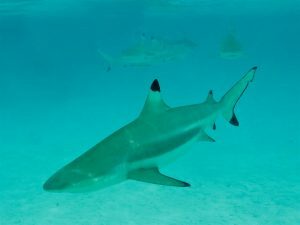 Later, Brian was in Magic’s cockpit when I heard him utter the uncanny words “the Lemon Shark is here.” My head felt light and empty as I ran outside to see for myself. Viewing the huge, dark Lemon Shark from above, right on my doorstep, felt like that stunning moment in the horror movie The Babadook when the book mysteriously reappears on the front porch after it is thrown away. By the way, I do NOT recommend this movie. It is well done, but oh-so-scary. Right away I knew. Lemmy. He was still under the boat. Luckily Brian worked the anchor loose without Lemmy “helping” and we got underway. When a new, unidentified shark visits during a scuba dive it is pretty cool. When it’s Lemmy the stalker shark, it becomes a treasured memory. I feel such reverence for these wild creatures, the difficult lives they lead, and the mystery of their emotions and behavior. 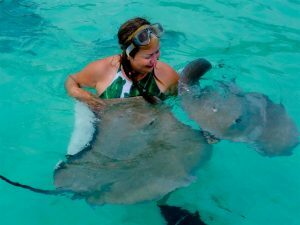 Moorea’s stingrays are soft and friendly. They are like sentient roombas searching for the best things to eat. Their excellent sense of smell guides them to what they love most: food. Snorkel with a fistful of sardines and they will quickly identify you as an object of love. They show their love in a physical way: by gently roomba-ing your entire body in search of the source of that delicious smell. Place a clump of sardines into the wrinkled, smiling food port located on the bottom of their body and watch them erupt with affection. Now they snuggle into your arms, rub against your back, and swirl around you, excited for more sardines. Food = love to a stingray. 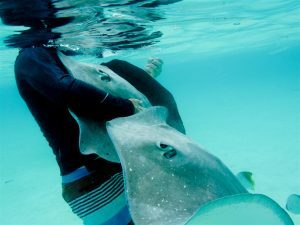 Most people who visit Stingray City on Moorea’s north coast do not feed the rays. Tour operators bring fish and dole it out to the excited rays while swimmers snorkel nearby. Wary Blacktip Sharks join the party, too, but are not interested in taking food from people. The stingrays are happy to receive pets from swimmers who don’t feed them, but will snuggle up to the ones with food. We noticed this during our first visit, and decided to bring food for them during our next visits. We wanted to feed them and see if they would cuddle with us, too. Magic was anchored near Stingray City so we could visit the rays as many times as we wanted with our dinghy. We arrived with several cans of sardines and found out why the tour operators were the only ones doing the feeding – the rays bite! They don’t have teeth, but their mouthplates can deliver a startling nip which sometimes breaks the skin. They don’t mean to hurt you, they are just eating and your fingers get in the way. Initially, a couple gentle love bites would not deter us. We learned to keep our fingers away from their mouths. We accepted the nibbles as the price of admission. We returned to Stingray City three more times, each time getting better video footage and photos of the sharks and rays. Our dinghy became greasy and sardine scented. We didn’t care. We would never forget our cuddly “Roomba Rays”, so friendly and food motivated, always ready to star in another video and brighten our day by climbing into our arms and searching our bodies for treats. 1. Keep your feet on the ground. The rays cruise along the bottom, following scents, and when they find your feet they know to swim upwards and investigate. 2. The rays love canned sardines. Fill your fist with sardines and hold on tight. When you swim in the water the rays will smell the sardines and come over to give you love. 3. Once you have their attention, break off small clumps of sardines and put them into their strange little mouths. You see, it’s difficult for them to find the food because their suctioning mouth is on the bottom of their body while their eyes are on top. You can make feeding easy for them by placing the food directly in their mouths. They will love you for it. 4. To avoid getting bitten, feed them larger clumps of food and keep your fingers away from their mouthplates. Hold your fingers together tightly and don’t allow them to munch on your thumb. 5. Bring at least three cans of sardines per person. You will go through the first can quickly learning the best feeding techniques. Stingrays are wild and unpredictable creatures. As the name suggests, they do have a stinger which they will use to defend themselves. 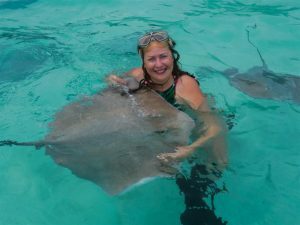 Feeding stingrays is not a risk free activity, but Moorea’s rays seem to genuinely enjoy interacting with snorkelers. And it sure is fun when you muster the courage to stuff food into their mouths, and they cover you with gentle roomba kisses. It’s such a sweet reward. I overcame the voices and self-published my first book about a month ago. It all happened so fast, and now I’m riding a happy little wave of success. My book has sold about 75 copies and sales continue to trickle in. People find it on Amazon, buy it, and when they leave a review it either warms my heart or causes me a sleepless night. “Breezy, fun writing style…” Oh my gosh, I have a writing style! “So well written!” Oh my gosh, I CAN write! “author has a real knack for the narrative…” Thanks, Dad. Dad was instrumental in the publishing of this book, and a ruthless editor. At least she liked my story and wasn’t trying to be mean. She had valuable feedback for me and she was right. I made a classic software developer mistake: not testing my product enough before deployment. I was excited. I was busy and burnt out from working so hard on it. I was a creative person who wasn’t being managed. I ran amok and had to learn better publishing habits. I embarked on a considerable effort to test my book across all devices and fix the formatting problems. This would be tedious work which would take several days to complete, so I settled into the bathtub and got to work. Yes, that’s right. I wrote and published most of my book in a clawfoot tub at our AirBnB home in Salt Lake. The tub was the most relaxing and focused place for me, and the purple walls may have helped. Somehow, I always managed to keep my computer from ending up in a watery grave, and never electrocuted myself (never plug in the computer while using it in the tub). I estimated this project would take approximately four baths, with each bath being 2-5 hours long. You do the math. I changed the Georgia font size from 16 to 20 and tested it across kindles, iphones, androids, and also used an application from Kindle that lets you see your book on multiple devices. The limitations of fixed format publishing were apparent, and no matter what I tried the book had tiny font on smaller devices like kindles and phones. I made sure the text was readable but it was too tiny to be practical on something as small as a phone. I added a short warning to my book description about the text size on smaller devices so people would know what to expect. One of the best things about the Kindle reading experience is the ability to customize the text, so from now on I will write my books in a flowing format and include a couple photos at the beginning and end to accentuate the story. No more of this text drama. I spent a lot of time formatting the book, and it wasn’t fun creative time. Uploading the book to Amazon and setting it up to sell it was an easy and solid process. The difficult part was formatting the many photos which I felt added to the story and needed to be included. Using a flowing format next time was an important lesson. Another lesson was the importance of combating feelings of doubt which can halt a creative project. Publishing a book helped me learn to quiet those thoughts. Everyone has feelings of self-doubt sometimes which must be overcome. And the greater the endeavor, the greater the chance for these doubting thoughts to kill a creative project. But it is always our choice to give in to this, or simply learn to counteract these thoughts and move full speed ahead in pursuit of our dreams. To publish or to postpone. To chase our dreams, or get stuck. The doubting thoughts fade away now with every book sale, and I know I did the right thing. I’m glad I tossed my first book out there to see if it would sink or swim. Self-publishing was a memorable process and my goal is to publish another book this fall/winter. Stay tuned! My blog has been pretty quiet for the last two months. 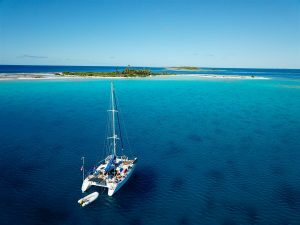 I’ve been writing a book about sailing the South Pacific! 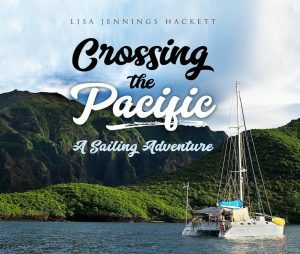 “Crossing the Pacific is a tale of adventure, growth and overcoming fear set in the tropical islands of the South Pacific. 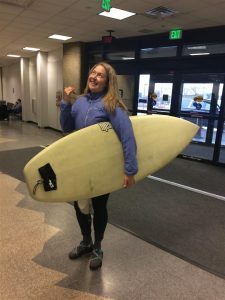 This is one woman’s story of sailing twenty-one days across the largest ocean in the world and then learning to love scuba diving with the sharks on the other side. This story is all about the manifestation of big dreams. Moving into a van, sailing across an ocean, writing a book, whatever you dream about, I urge you to do it. Go after your biggest dreams, even the really crazy, uncomfortable ones, and bring them to life. My book is available on Amazon Kindle here for $2.99. My friend Katie gave me crabs. It was an accident. It started with a gift: a hermit crab named Pagoo. Katie and I were strolling the beautiful beaches of Fakarava when she handed me a 3 inch long, white, cone shaped shell. It was lovely, and I put it in my backpack. Later I would add it to my zen garden on our sailboat. 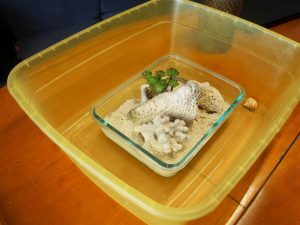 I had been working on a tiny zen garden where I could put my favorite South Pacific shells, sand, and a small pink cat symbolizing the kitten I loved and gave up last year, named Sherbert. When I unpacked my bag later and removed Katie’s shell I soon found it crawling around on the table. A hermit crab was living inside. We see hermit crabs all over the beaches of the South Pacific. They are entertaining but I never thought of them as pets until Katie unwittingly introduced one into my home and heart. I picked up the little crab and offered it a crumb of bread. It reached out, legs and antennae wildly waving, and took the bread. It nibbled delicately as I watched, and I started to fall in love with the sweet creature. It doesn’t take much for me, I guess. I named the crab Pagoo, after a crab Brian had as a child. I placed Pagoo in my zen garden and enjoyed watching him climb around on my favorite shells. Everything about Pagoo is so endearing. He’s a tiny crab in a big shell, which means he is really clumsy. 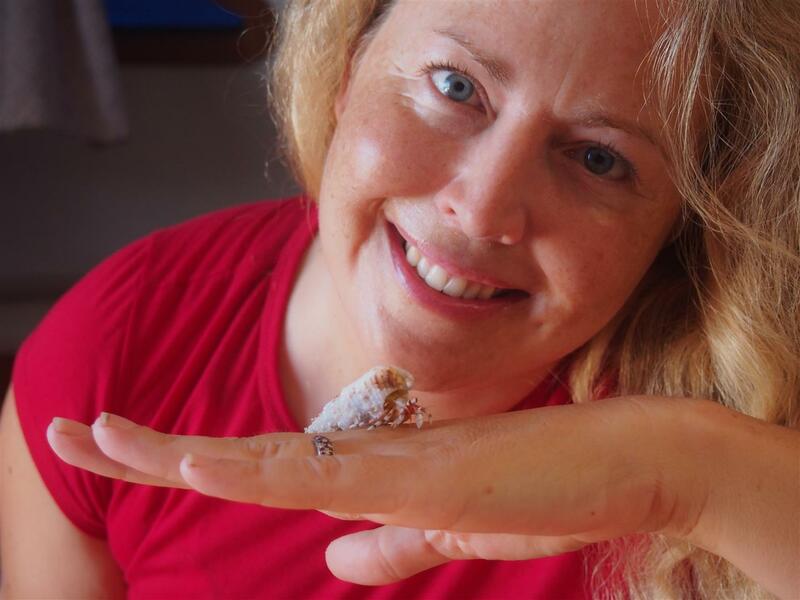 He’s an easygoing crab who enjoys gently crawling on my hand and being hand fed. I learned on Wikipedia hermit crabs are social and need to be with other crabs, so Katie and I went to the beach to find friends for Pagoo. We selected four crabs of different sizes, all smaller than Pagoo. Pagoo did seem happier with his new friends. I sometimes found the five crabs huddled together, and they seemed to enjoy each other’s company. It’s fun to give them new shells to call home. I offered them a small white shell my friend Morgan gave me, and left it in the garden overnight. By morning it was occupied and the smallest shell became vacant. The crabs were upgrading. I walked the beach looking for more new shells for my crabs. I found a peach colored shell which seemed about the right size. I placed it in the zen garden and the next morning found one of the crabs had moved into it. It was hard to tell which crab was in the new shell, but I figured it out pretty quickly. One of Pagoo’s friends, previously in a white shell, immediately stood out as the most rambunctious and active crab. He would race around my hand trying to jump off the edge when I would hold him, and was very active in the garden as well. This compulsive crab definitely seemed to be the one inhabiting the new peach colored shell. So I named him Peachy, and soon his escape antics began. 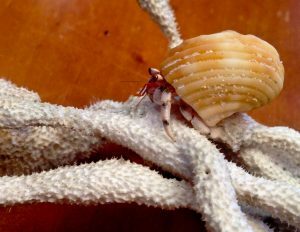 Peachy, empowered by his new shell, was ready to explore the world. A couple nights later he escaped the garden and I found him crawling on the table the next morning. Then, one stormy night, Peachy escaped the garden and took a three foot fall onto the floor of the salon. It was about 2 AM and I was already awake because the boat was rocking dramatically at anchor in a storm referred to as a Mara-mu. When a storm has a special name, I suppose I shouldn’t be surprised when it brings drama. I had just gotten up to put things away. Lying in bed again, I heard a distinctive sound, a soft clink, and I knew immediately what it was. Peachy had escaped again and this time had jumped onto the floor. That crab. I got up and found Peachy crawling on the floor, unharmed after his big fall. I placed him back in the garden and he buried himself in the sand. Peachy seemed mad at me for the rest of the day. Peachy is not easygoing like Pagoo. Peachy proceeded to get out almost every night, and one time he was missing for a day until Brian found him on the floor in one of our storage bunks. We devised a double wall system to keep him from getting lost in the boat again. It worked, which I’m sure displeased Peachy. But ultimately, he was the one who would most enjoy his release back into the wild, and I didn’t want him to be deprived of that and end up trapped on Magic. The crabs have their own personalities. Peachy dreams of escape while the other crabs seem content in the garden. Pagoo is inquisitive and enjoys exploring my hand. The other crabs seem more interested in finding their way back to the garden when I pick them up. Pagoo is the only one who will take bits of food directly from my hand. And then there’s Peachy. Peachy is the wild one. They all seem to enjoy climbing to high points, though. They are often found perched at the top of the tallest thing in their garden. I can relate so I found them a climbing wall on the beach. It’s a steep piece of coral with many handholds, or clawholds. It has routes of varying difficulty. The crabs love scaling it and sitting at the top. 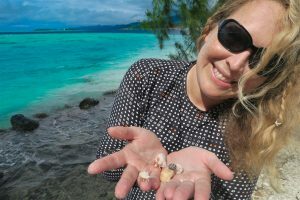 Some people spend a lot of money on their hermit crab hobbies, but here in the South Pacific I can find all the things the crabs need on the beach. They are the perfect sailboat pet. 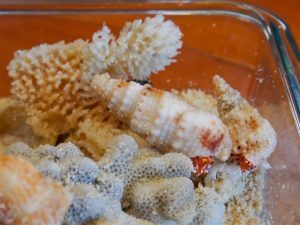 My friend Nancy found natural sponges for the crabs, and gave them as a gift. They love Aunt Nancy now. I soaked a sponge in water and introduced it to the garden. The crabs enjoy sitting on it and licking the moisture from its surface. Every now and then they all crawl under it, nestle in the sand, and hide for awhile. What they are thinking, I will never know. UPDATE: Our crabs were released on a small island in the Raiatea lagoon a few days ago. This island is tiny and can be circumnavigated in a couple minutes. We found other hermit crabs just like them, so we know they will survive. We placed a small pile of food on the beach for them, then they crawled off my hand and began immediately exploring their new home. I hope Pagoo is growing into his shell and Peachy is enjoying his freedom. Mostly, I hope they had a good time with us. Our short term visa is over in French Polynesia, so we had to store Magic and come back to the US for 9 months. 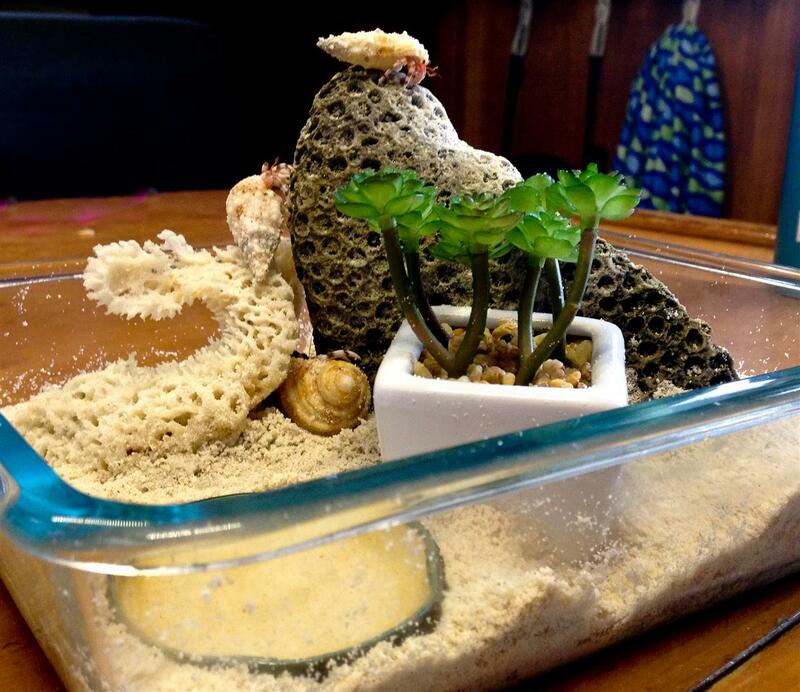 I’m already looking forward to my hermit crabs and zen garden next season on the boat. That’s my yearly theme: crossing over. Crossing over boundaries of fear. Instead of a New Year’s resolution, a good friend suggested people come up with a theme for the year, and I liked that better. Only I didn’t want to tell too many people about it until I was sure I could do it. Because these were big things. This was not your basic “I’m going to the gym every morning” type of resolution. I wanted to cross the Pacific Ocean with my husband on our sailboat. I wanted to dive with the hundreds of sharks on the other side. But I was so afraid of both these things. They required placing myself solely in the hands of nature and suspending my sense of control over what happened. After much analysis I decided at a mental level these things were reasonably safe, although they still felt scary. So I crossed over, despite the fear, and found only good things on the other side. 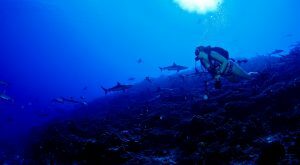 Brian and I sailed across the Pacific Ocean and now I’ve done one of the biggest shark dives in French Polynesia. Five times. For most divers, this will be the biggest shark dive they ever do. Only I get to do it over and over again, living minutes away aboard Magic. 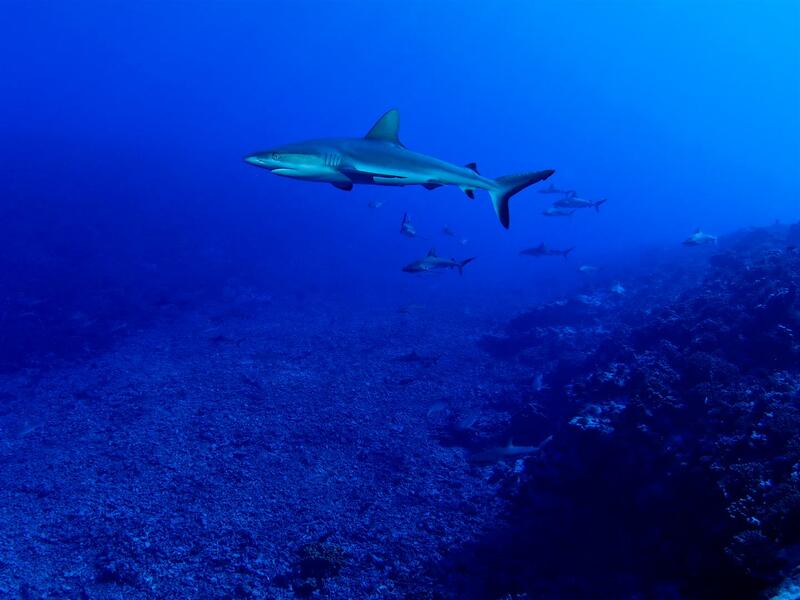 The South Pass of Fakarava easily has over 250 sharks swimming slowly into the current. There are Gray Reef Sharks, Black Tip Sharks and White Tip Sharks. These sharks see divers every day. They are used to being observed and neither flee nor circle you, they just drift on by. They are bored with you. The huge aggregations of sharks have been respectful of our personal space and are actually really nice diving companions. I challenge you to look at these creatures with an open mind and enjoy these images without fear. 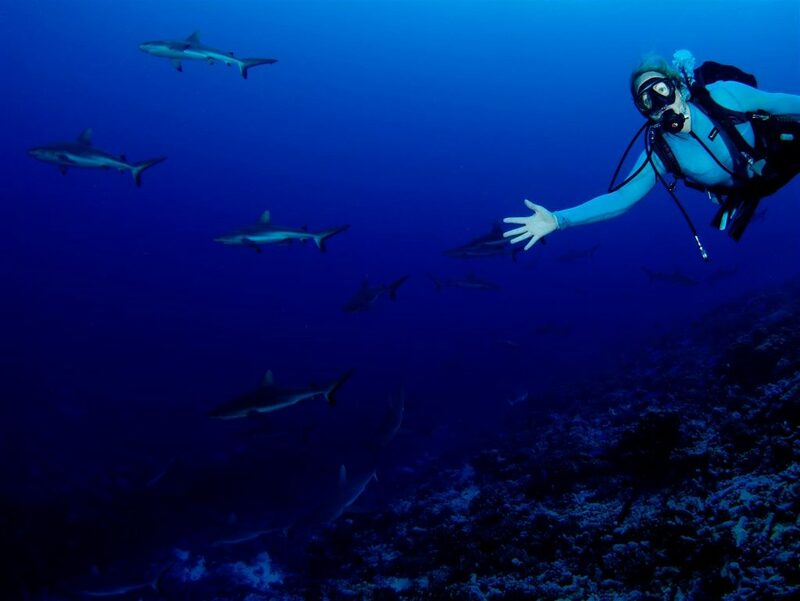 Meet the sharks of Fakarava. 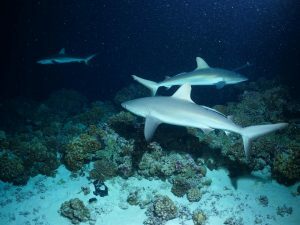 Yesterday we did the big shark dive at Makemo Atoll. It was one of the best days of my life. 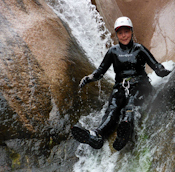 Brian and I had a simply wonderful day overall, plus the dive was exhilarating and empowering. Wow, just wow. It was a drift dive where we rode the current of the flooding tide into the lagoon. We took our dinghy up to the place where the lagoon empties into the ocean. We tested the current to be sure it wouldn’t push us out to sea and then entered the warm water. Brian clipped our dinghy to his BCD using a floating line. We then descended about 50 feet and rode a gentle current into the lagoon. 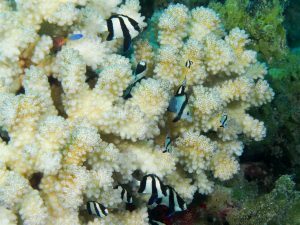 Beauty abounded as we drifted past caves full of fish and enjoyed healthy coral blanketing the sea floor. During the dive the current steadily increased due to the rising tide. After 30 minutes the current had become significantly faster and I was starting to run out of air. Then we drifted by the sharks. It was an intense and agitated scene. First I saw schools of shimmering Big Eye Scads darting around crazily. The fish were fleeing from at least 25 feeding sharks, which began to come into view as the current carried me directly toward them. 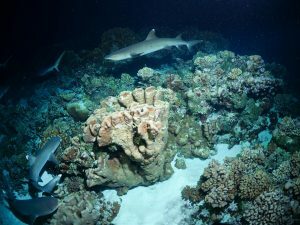 Gray Reef Sharks, Blacktip Sharks and Whitetip Sharks were rapidly flowing over the colorful coral bottom, chasing fish and rooting around in crevices. I flew by them on the rapid current, awestruck. They swirled around me, continuing their activities with an attitude of indifference. It was such an overwhelming scene I could barely think. But the thoughts I did have were focused on the fact I was nearly out of air. I kept telling myself not to lose myself in the moment with these sharks. I felt no fear. The sharks were doing their thing and I was doing mine. We shared space for a brief moment in time, and they graciously accepted us. That’s how I thought of the sharks. Gracious. Sure, they could get right in our faces and scare us, but why? It would be a waste of time. They are more pragmatic than that. Better to be gracious hosts and tolerate the strange black divers until the current quickly sweeps them away. A couple sharks found a tasty morsel in a crevice and a small feeding frenzy began right at the end of our time with them. You can see a little bit of it at the end of the video. And then that was it. We had drifted past them and they were gone. We began our ascent back to the surface and to our dinghy, glowing from an unforgettable dive. 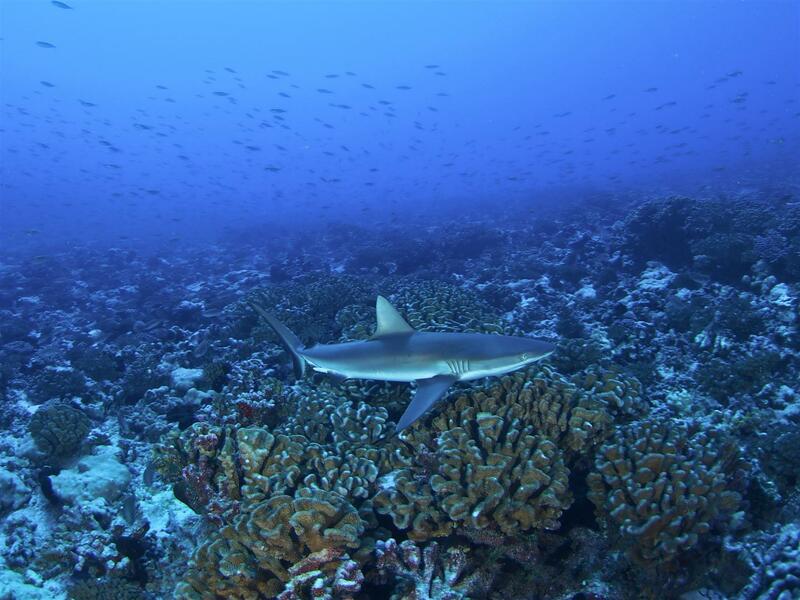 There are plenty of sharks in the Tuamotus. This morning when I was at 60 feet a gray reef shark swam by and checked me out. I hovered in place and turned on my video camera as the graceful, curious creature slowly became larger and larger in the frame. It continued closing the distance between us until it was only 15 feet away. Then it veered off and went the other direction. I’ve always had mixed feelings about shark diving. I’ve done it, yes, but always felt a jolt when I saw a shark nearby. I definitely felt plenty of jolts last year at the Revillagigedos when a few Silky Sharks got too interested and started circling us. Brian finally hit one of them with his camera and then they left. Oh yeah, big time jolts. I love sharks, but they can be frightening, too. They don’t always flee like other fish; they’re more curious and attentive than other animals I’ve met underwater. And sometimes they’re bigger than me. 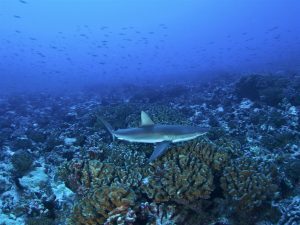 We’ve been in the Tuamotus for eight days and we see sharks on almost every dive. I am fascinated by them and they haven’t been aggressive at all. We haven’t seen any Silkies either, which I like. We see plenty of Gray Sharks, Blacktip Sharks and Whitetip Sharks. Each day I have become more comfortable with the sharks. The jolts have nearly gone away. When I surprised a sleeping shark a few days ago I felt a tiny jolt, but not much. 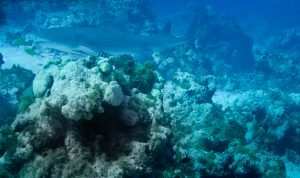 I swam around a corner and had a close encounter with a small whitetip shark. It darted right in front of me and quickly swam away. Today when the reef shark came right up to me and I didn’t feel a jolt, I realized I am ok with this now. I’m ok with these sharks. I’m ok with their curiosity. The next question is, am I ready for the big shark dive? There’s a pass here where you can ride the current past 50+ sharks and thousands of colorful fish. Brian and our friends Dan and Kristy have been doing amazing drift dives there each day. I’ve snorkeled the pass and seen the sharks. It’s truly an incredible sight and I want to experience it close-up, underwater. I think I’m ready. I want to drift dive with 50 sharks. Internet, what do you think? Am I ready? Should I do this tomorrow?